The life of the unmillennial is clearly filled with some serious topics — are you saving enough for retirement, have you reached the peak of your career and why do the aches/pains that used to disappear linger these days? Those are all topics worth featuring on the show, but that’s absolutely NOT what we’re discussing today. ‘Cause a girl’s gotta do what a girl’s gotta do. And I gotta do eyelashes. If you’ve ever thought about glamming up your look or simply improving that wand of mascara in your make-up bag, today’s show is for you! Next, you’ll hear from Danielle on her experience with lash extensions and learn more about the pros/cons, time commitment and cost. 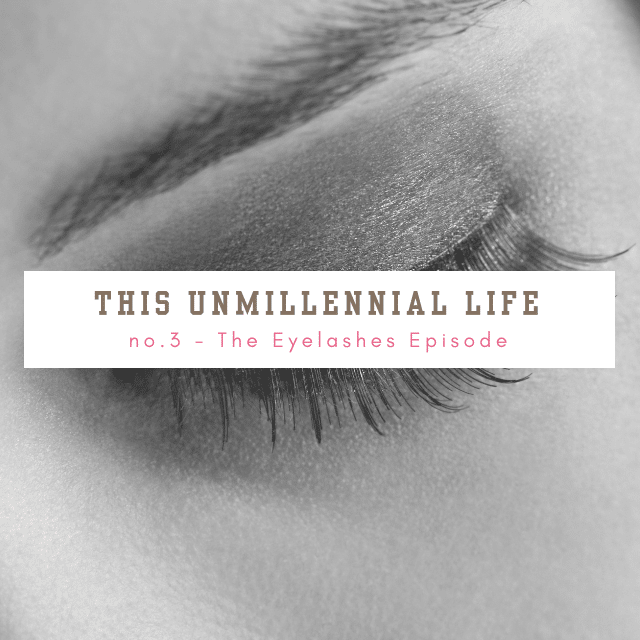 My last guest, Gretchen, will share why Magnetic Eyelashes were the best option for her and share insights about how easy (or hard) the lashes are to actually apply. I’ll round out the discussion with insights into my absolute favorite mascara (affiliate link), plus provide some helpful tips on choosing just the right tube. To close out the show, you’ll also hear a fun feature entitled “If I had a VCR, I’d record this.” Thinking fondly of the days when a VHS tape recording of your favorite show was your best bet for “binge watching,” I’m giving a little preview of what I think you should be watching NOW on Netflix! If you’d like to be featured in an upcoming show, either sharing what YOU are loving on Netflix now OR addressing my favorite question “What Makes You SO Unmillennial,” simply send me a voicemail (via the widget to the right ->) OR, join the This Unmillennial Life Facebook Group to keep the conversation going. I’d love to hear what’s on your mind! Musical support provided by Ben Williams at Kudzu Studio. Website support provided by Katy Widrick at MakeMediaOver.com. Additional support provided by Jim White of JimWhiteFit.com and Robin Plotkin of RobinsBite.com. Loved the show. Just clicked on your link and ordered two tubes of L’Oreal mascara (and a raincoat for ELLA!). As you know, I’m not much of a makeup girl so I’m counting on this to make me look stunning! Awesome 🙂 Hope you like it!